This 176+ page printable journal collection is specially made for the bullet journal and printable planner lovers in mind. If you like doodling, writing notes, scrap booking, using washi tapes and cute stickers on your journals.. this is for YOU. 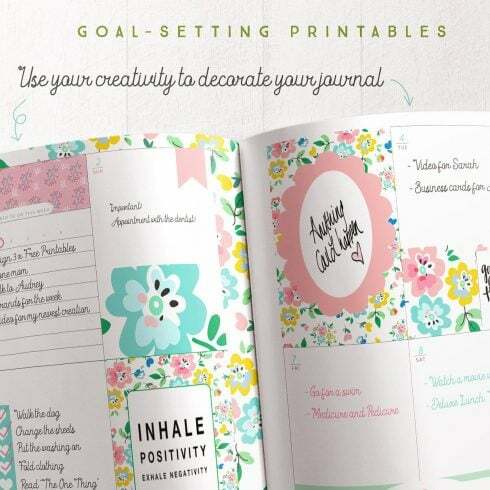 This collection is a cross between bullet journaling and goal-setting printables. I took the best of both worlds and created something special with this magical theme. Although this is not your typical bullet journal you see out there in the market place, I have designed it to simplify the lives of bullet journal fans; keeping in mind for those who enjoy goal-setting printables as well. 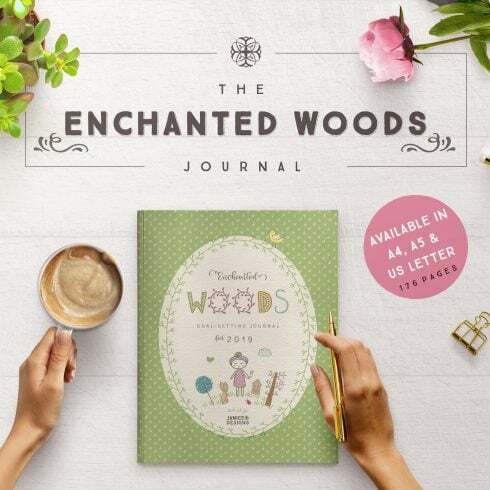 Cute and magical clip arts which makes your journal one of a kind. Help you stop wasting precious time, so you can focus on what matters most – planning, creating and exploring your creative side so you can create the journal you love using. There’s NO journal rules to follow. You set your own rules! Be more organized and help you achieve your goals – writing your goals down will provide a psychological blueprint and increases the likelihood of achieving them. Help boost your memory and understanding – the act of writing causes the mind to create the formation of letters in the brain which then causes the mind to formulate ideas while journaling. This helps you to remember and comprehend better. Help you to heal emotionally, physically and psychologically when you practice expressive writing. Boost self-confidence -The release of endorphins and dopamine will help boost your self-esteem and mood when you write about a positive experience. This allows your brain to relieve it and reaffirms your abilities when self-doubt appears. Get your copy today and enjoy the benefits of what journaling and goal-planning can do for your mental health and your life. Only for personal use. You’re not allow to re-sell this item or use it for commercial use. Just what is a graphic bundle? If you are a artist working on several assignments , you comprehend the need for the whole bunch of design elements available at hand. Hunting for those elements one at a time, you spend whole lot more time and cash . To get all of the essential components within a single pack, we recommend taking a closer look at graphic package deals. A bundle can be described as a selection of digital elements needed for graphic design, priced at a large amount of money, yet offered at a bargain price tag for a short time. What’s the point of using deals? For any design job, you will need a lot of elements – a few icons, a handful of pics, a font, and so on. In case you’d wish to shop for all of them on an individual basis it will cost you a lot of money! So, that’s why experienced web designers look for graphic packages to buy. They allow receiving a big selection of various graphic elements for a modest price tag. What types of graphic package deals are there? The collections of elements compiled into a graphics package deal are often sorted according to their main objective or type. There could be packages with business card templates, mockups, wedding invitation templates, infographics and icons, etc. You will likely manage to find graphic packages especially for Halloween, Christmas, Halloween or Christmas. Any approaches to make bundles even cheaper? Ok, I am aware they are already affordable, there is however still some place for saving. Just share this web page via social websites – you get the 5% price reduction for the graphic packages you prefer. That is a quite simple way of getting an expertly designed tools cheaper. MasterBundles.com presents you a big assortment of different items. MasterBundles markets not only graphics bundles but additionally something like 20 other different types of products. Fonts, WordPress themes, mockups, icons, photos, illustrations, presentation templates and a great deal more – on the MasterBundles it’s possible to obtain all of the items, essential for a design project creation. Define a watercolor graphics package? The watercolor bundle is found to be the prettiest innovation in design. Painted by painters on the a piece of paper, the wonderful pictures become digitized and added in a package as templates for projects. Watercolor elements are just great for posters, DIY, wedding invitations, blogs, greeting cards and quotes. All of the illustrations are highly detailed and ready to printing or use digitally. It is not enough to just submit a few photos to have a popular and successful Instagram account. To seduce followers, your Instagram feed should look stunning and attention-grabbing. Instagram themes will help you to make that happen and help to make your Instagram content eye-catching and identifiable. Accumulated into packages they are often bought for a lower price, so don’t miss it! What is infographics package deal? If you ever need infographics for the future business presentation in different businesses through social media and marketing and advertising to medical care and education, the package is right what you were looking for. With the infographics bundle you’ll find yourself saving time which can be important in terms of performance efficiency. Every element is available in an independent file that may be customized in Powerpoint, Illustrator or Photoshop. The designers who like to do business with photographs are going to be particularly pleased with the photo overlays graphic deals. These offers incorporate multiple elements of design that can spruce up and modify the images. This kind of ornamental components can be laid across the images to create some new and attention-grabbing look. Whether you feel as if you’ve lost track of time while looking for different resources and elements for your design projects, it is high time to understand more about MasterBundles. It is a platform providing the most in-demand tools (watercolors, presentations, graphics etc.) for designers, entrepreneurs, and developers at an affordable price for a limited time. To not miss out on major updates on the forthcoming promotions, we recommend reading our blog and signing up for the newsletter.